Lu Shaye, China’s ambassador to Canada, speaks during an interview at the Embassy of the People’s Republic of China in Ottawa on Thursday. 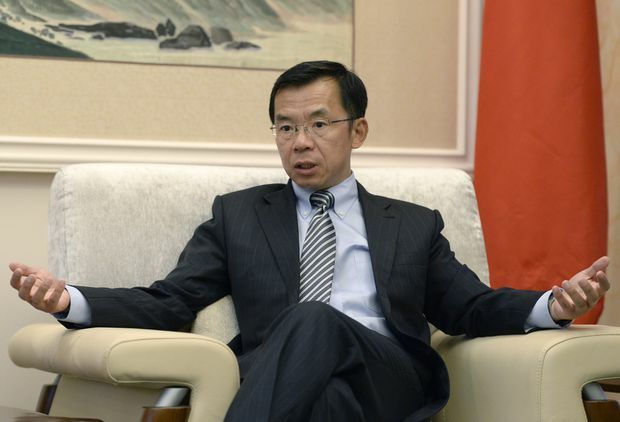 China’s envoy has accused the federal government of discrimination for blocking the takeover of a Canadian construction giant by a Chinese state-owned enterprise on national security grounds, calling on Canada to get rid of such ”demons” of prejudice against his country. In a column published in The Globe and Mail on Tuesday, Ambassador Lu Shaye said that the Liberal cabinet expanded and politicized the concept of national security when it cited threats to sovereignty in rejecting the $1.5-billion sale of Toronto’s Aecon Group Inc. to China Communications Construction Company (CCCC). The outspoken envoy did not threaten retaliation but made clear Beijing won’t put up with Canada questioning China’s one-party rule and its state-owned enterprises that operate around the world. David Mulroney, a former Canadian ambassador to China, said Mr. Lu ignores that China closed off entire sectors of its economy to foreign investors without any reason given. The Trudeau government has finally realized that many state-owned enterprises are beholden to President Xi Jinping’s political objectives, Mr. Mulroney said. Mr. Lu blamed the Canadian media for “demonizing Chinese state-owned enterprises” and “repeatedly hyped CCCC as one of the state-owned enterprises of China, which they described as monsters,” he complained. Prime Minister Justin Trudeau says his cabinet vetoed a Chinese state-owned conglomerate’s takeover of Aecon because of concerns it could control critical infrastructure projects and threaten Canadian sovereignty. Aecon is a partner in a $2.7-billion refurbishment of Ontario’s Darlington Nuclear Generating Station, is building the massive Site C hydroelectric dam in B.C. and until recently was bidding with a team to construct and operate the $4.8-billion Gordie Howe International Bridge connecting Windsor and Detroit. Mr. Lu said Ottawa’s rejection of the deal will “result in much greater loss” for Aecon than China, saying the acquisition was a minor purchase for CCCC, which is one of the largest construction firms in the world. Intelligence agencies in both Canada and the United States have warned that companies owned or partly owned by the Chinese government are not merely profit-seeking operations; they are also prone to passing on information or technology to Beijing and making business decisions that could conflict with Canadian interests but serve the agenda of the authoritarian Communist Party of China. The Chinese envoy also denied that Beijing has been stealing Western technology – an accusation that has levelled against telecommunications giant Huawei Technologies in the aftermath Nortel’s bankruptcy. The Globe and Mail reported Saturday that Huawei has established a vast network of relationships with Canadian universities to create a steady pipeline of intellectual property that will aid its development of next-generation 5G mobile technology. Canadian university professors and researchers have transferred full rights to their inventions to Huawei in 40 instances. Without mentioning Huawei by name, Mr. Lu said China has long been a “powerhouse of independent innovation” and it only makes sense for Western countries to co-operate with Chinese firms – or be left behind.